Faith without works is dead-So get to work! Happy Friday to you all! I pray that you had a productive and blessed week and I pray that you have a blessed weekend. TFTD: Faith without works is dead-So get to work! First let’s define faith and works. Faith is having confidence or trust in a person’s or thing or a person’s ability; a belief that is not based on proof. Works is defined as the exertion or effort directed to produce or accomplish something; labor. When we have faith in God we are saying that we have confidence that He is able to do all things that we hope for and ask for without any physical proof that it will happen and we will demonstrate our faith by putting action to our belief. If I believe that God will give me a new job, I will begin preparing my resume, actually looking for jobs, taking necessary courses that will increase my qualifications, etc. If I am praying for a new house, I will begin getting my debt in order, I will begin taking classes on homeownership, I will seek guidance on the right lender to use and so forth. When I prayed for God to send me a husband, I began diving in His word on my role as a wife, reading and studying on marriage, surrendering myself to the will of God in preparation for what I prayed for. You see when you have faith you must back it up with the work. Allow me to make it extra plain. You can’t say you have faith that you will eat a good meal tonight, but go home and sit in the kitchen looking at the stove. You have to prepare the meal. You can’t say you have faith that you will get an “A” on your test and not study for the test. You have to prepare to succeed. At the end of the day you must put your faith into action. God wants to see what you will do. God wants to see how much you believe that He will manifest the miracles in your life by the action that you put into life. Faith without works is dead, so get to work! Stop crying and praying and praying and crying for God to move in your life if you are not going to get off of your rear-end and go to work! Nothing in life comes easy and if you want to see God move in your life, take the first step and go to work! I dare you to begin walking in your destiny by planning and preparing for the harvest. God is not one who can lie and if He gave you the vision and the desire than He is faithful to deliver. It’s time for us to do our part and get to work! Have a blessed day! God bless you all! Good morning! Happy “Hump-day” to you! I don’t know about you, but I am glad that God woke me up, clothed me, gave me a sound mind, movement of my limbs, articulation of speech, employment, my health and the list goes on. Don’t waste precious moments complaining when you have so much to be thankful for. Who makes up the body of Christ? I’m glad you asked. Every person who has accepted the Lord Jesus Christ as their personal savior is a member of the body of Christ. We all look, sound, act and think differently, yet we are all members of the same body. God created us to be unique individuals filled with different gifts and talents. Scripture tells us that we do not have the same function, but we are all members of one another. So, why do we as believers try to mold and change people to fit an imagine that we deem “holy”? Why is there competition in the church and against the ministries within the church if we are all members of the same body of Christ? When I think of the body of Christ I think of a puzzle. A puzzle, once complete reveals a remarkable image. Children of God, we all are pieces to a puzzle and it doesn’t matter if you are a corner piece or the center piece. We are all needed to complete the puzzle and reveal the beautiful picture. That beautiful picture is the image and example of Christ. It’s time that we learn to work together so that people can see the beautiful picture of Christ! Ministry is not about us anyway, but about leading people to Jesus Christ who is the Only One who saves!!! We need to start embracing and celebrating our differences. We need to respect each others differences because we enhance one another. The scripture tells me that we are all individuals who may serve in different capacities, but at the end of the day we are all apart of the same body; the body of Christ. It also shows me that we are individual members of each other. So guess what? I need you and you need me. You make me better and I make you better. When we all work together God is glorified and more people are lead to Christ. You are an important piece to the puzzle. It doesn’t matter if you are titled leader, minister, teacher, preacher, choir member, usher, deacon, etc. If you are a child of God then you are VERY important to the body. Once we begin working together we can get more accomplished for the kingdom. Let’s lay aside individual agendas and look at the bigger picture; how can we lead people to Christ? I pray that you embrace the differences of others and know that you are all valuable pieces to the puzzle! God bless! Good morning! Happy Thursday to you all! Remember, never get so big-headed that you forget who carried you to your destination. I am nothing without God so I’ll praise Him every chance I get. I love reading God’s word. It brings so much clarity, insight, confirmation and peace into my life. It even brings correction whether I like it or not, God’s word is always right on time. I am determined to finish. How about you? Are there things that God has placed on your heart that you’ve started, but somewhere along the way you slowed down, took a break or perhaps you gave up on it? We’ll I want to encourage you to get back in the race and finish. “do not fear nor be dismayed, for the Lord God—my God—will be with you.” You have nothing to fear when you are on your journey because God is always with you. This is the assurance we need. To know that God is with you, fear can be thrown out the window. We know in 2 Timothy 1:7 “For God has not given us a spirit of fear, but of power and of love and of a sound mind.” Since we know this we can walk with confidence that we will finish strong. “He will not leave you nor forsake you, until you have finished all the work for the service of the house of the Lord. It’s awesome to know that the Lord will not leave you nor forsake you, UNTIL you have finished all the work for the service of the house of the Lord. Do you understand that God is with you every step of the way. When your desires become God’s desires, He wants to see every task through to the end. And after you have completed all that God has called you to do on this earth, He still won’t leave you because He will call you back home with Him! God gets the glory when you are determined to finish what He has placed on your heart! So you see, on earth you win and in heaven you win with God on your side!!! Are you determined to finish? Are you determined to praise God through the ups and downs? Are you determined to be strong and be of good courage? Are you determined to put fear aside and push towards your destiny? Are you determined to give God all the glory and the honor? Are you determined to FINISH? I challenge you to dust yourself off and continue on your journey. God is always with you! Trust in the Lord and allow Him to be your strength. There is no time for excuses. Decide that you are determined to finish what God has started in you! …when you think no one’s watching…. What are you doing when you think no one’s watching you? How do you treat others? What do you say when you think no one’s watching? It’s amazing how there are so many believers of Christ living inconsistent lives. They speak Christ, but they don’t live Christ-like. The battle with choosing a side of the fence to stand on and refusing to straddle it, grows more challenging. Too many believers won’t choose a side. Too many believers are trying to please man and God, but my bible says, in Matthew 6:24 (NKJV) “ “No one can serve two masters; for either he will hate the one and love the other, or else he will be loyal to the one and despise the other. You cannot serve God and mammon.” So I ask, what are you doing when you think no one’s watching? Your life may be the only bible that anyone ever reads and it saddens me that there are tainted versions of the bible. Don’t get me wrong, I’m not saying that we should live perfect lives, but we have to stop condoning lives filled with sin and inconsistencies. We are not doing Christ justice, by shouting on Sunday, but cursing on Monday. We are confusing the unsaved by saying “thank you Lord” on Tuesday, but meet me at the club on Friday. We are committing spiritual suicide when we pray to God on Thursday, but doubt Him at the very sign of trouble. We are contaminating our children when we live inconsistent lives. I know you didn’t ask to be an example, but when you accepted Christ you became an example to the lost. When you opened your mouth and confessed your sins, you became an example for the hopeless. So I ask you, what are you doing when you think no one’s watching? Are you living a consistent life for Christ? 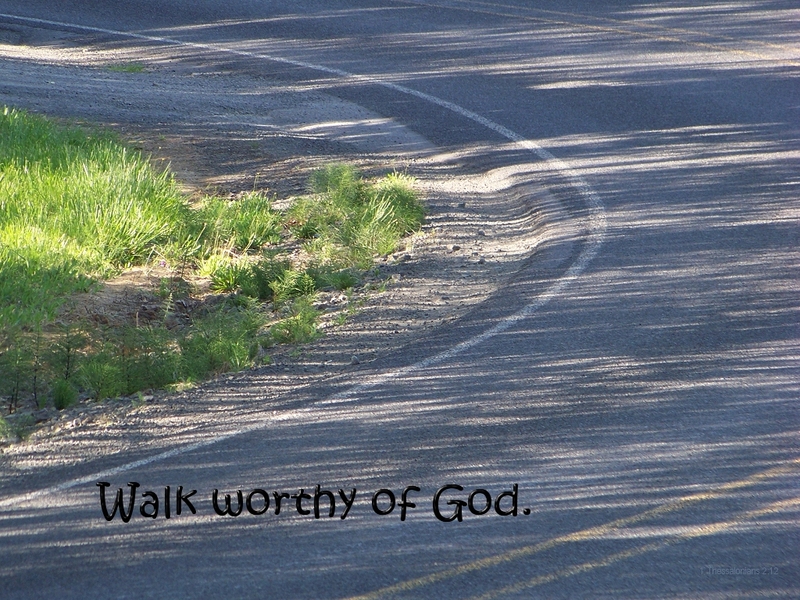 Are you walking worthy of the Lord? Are you guided by the spirit of God or by the spirit of man? If someone saw you Monday-Friday would they say you are the same person on Sunday? When people see you do they see Christ or a demon? Your life is either a testimony for someone to keep going or a reason for them to give up. What does your life say to others when you think no one’s watching? I’ve discovered that children and adults will act on their best behavior when they are in the presence of certain people, but your character comes out when those people are not around and we see how you really act. Take time to examine your life because whether you like it or not, someone is always watching you! Have a blessed day. Remember to strive to live a consistent life for Christ! I remember exactly where I was on September 11, 2001. I remember the state of disbelief I was in. I remember the radio station I was listening to. I remember the fear in the eyes of many. I remember the lives lost. I remember falling to my knees and praying. We will remember the innocent lives lost, we will remember the day our country was shaken, we will remember to keep the families who lost loved ones in prayer. We will remember to run to God and keep Him first. We will remember that prayer changes things. We will remember to hug each other tighter. We will remember to love each other more and argue less. We will remember that life is too precious and too short. We will forever remember. My prayers go out to everyone affected by 9-11 directly and indirectly. May God continue to be your peace. Poetry Corner- I want more!!!! Good morning! Happy Tuesday to you all! I pray that God continues to bless you all in a mighty way. And since I want more, I will get it! I want more of HIM! Have a blessed day andremember that everything you desire to become can happen and so much more, but you must start with Christ, lead with Christ and live for Christ! Stop living a defeated life! Good morning! Happy Thursday to you all. That Labor day holiday threw my week off, but I’m here! (Giggling) It’s back to school for my kids and back to school for me. We are all in an exciting time in our life and we owe it all to God! This is a PUBLIC SERVICE ANNOUNCEMENT: If in fact you are a believer of Christ then the Spirit of the Living God dwells within you. Since the Spirit of the LIVING GOD lives within you, it’s important that you know that the power that God used to raise Jesus from the dead dwells within you. SO, STOP LIVING A DEFEATED LIFE! You are filled with POWER! When the doctors give you an ill report, don’t walk around with a defeated look on your face, trust in the POWER that is within you. If God can raise Jesus from the dead, surely He can heal you. When your current employer hands you a pink slip, don’t walk around feeling defeated, rely on the POWER that is within you. If God can raise JESUS from the dead, surely he can give you a newer and better job. Promotion comes from God. When your money is funny and friends are few, don’t walk around throwing yourself a pity party. Tap into the power of God and know that He is the great provider and He is a friend that sticks closer than a brother. There is power within you so STOP I repeat STOP living a defeated life! It’s no wonder that people on your job, in your community, in your church, and even in your family never want to come to church or find Jesus because when they look at you they question does God really exist. STOP LIVING A DEFEATED LIFE! At the first sign of trouble immediately begin to pray for God to be your peace. Ask God to give you strength for the people who are watching you. Ask God to plaster a smile on your face to hide the hurt in your heart. Ask God to guide you through this trial. Then begin praising Him. Praise God for His power, praise Him for His protection, praise Him for being God. When you tap into the power that dwells within you, you should be able to walk in victory. You may lose some battles and even get some scraps and bruises along the way, but isn’t it great to know the war is ALREADY WON? I decree and declare that no weapon formed against you shall prosper, I speak courage into your life, I speak confidence into your life, (not confidence in your ability, but confidence in God’s ability through you), I decree and declare that the enemy has no dominion or rule over your emotions, I bind the spirit of defeat in the name of Jesus, I bind low self-esteem in the name of Jesus, I bind fear in the name of Jesus, I bind a complaining spirit in the name of Jesus, I bind complacency in the name of Jesus, I bind anything and any person who is against the will of God in the name of Jesus. You are more than a conqueror and I say walk in your victory and know that in the end YOU WIN!!!! Have a blessed day and embrace the power within! After all, we WIN!! !